Automated ad buying and selling tools are increasingly driving digital ad sales in the U.S. That means less human-mediated, manual sales, and more opportunities for ad tech specialists to gain a share of ad spend. A new report from BI Intelligence finds that real-time bidding (RTB), a key piece of the programmatic ecosystem, will account for over 33% of U.S. digital ad sales, or $US18.2 billion in 2018, up from just $US3.1 billion in 2013. In the report, BI Intelligence looks at all the numbers and explores the drivers of programmatic adoption. 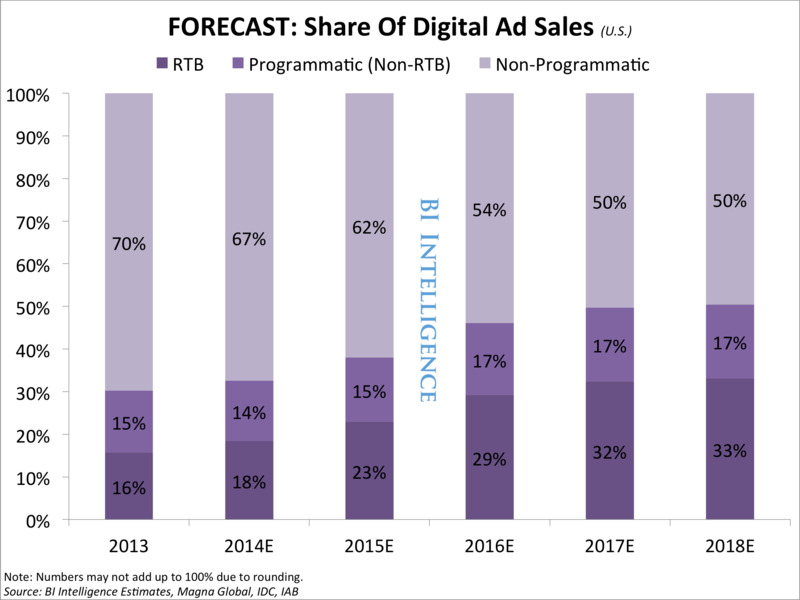 Programmatic and real-time bidding (RTB) ad spend is growing fast. RTB will account for over $US18.2 billion or 33% of U.S. digital ad sales in 2018, up from just $US3.1 billion in 2013, growing at a compound annual growth rate of 42%. Programmatic will be 50% in 2018. Mobile and video ads will be a major driver of this growth, with RTB sales for these formats topping $US6.8 billion and $US3.9 billion in 2018, respectively. A number of companies are already cashing in on the growing programmatic market. Top programmatic ad companies include Criteo, Rocket Fuel, the Rubicon Project, and AOL. These four companies pulled in more than $US1.5 billion in combined global ad revenue in 2013, accounting for more than one-tenth of global programmatic ad dollars. Prices for programmatic ads are increasing for almost all ad types, as demand outpaces supply. The effective cost per thousand impressions (eCPM) for social ads was up by 64% between January through April 2014, compared to the same time period one year earlier, according to Turn. There are still a number of barriers to adoption. Top barriers include brand worries that they will lose control over where their ads will appear, internal resistance at ad agencies, and lack of transparency in the industry over methods and results. 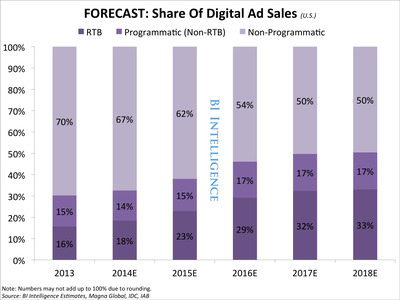 Sizes the market for programmatic/RTB spending. Breaks out the formats that will drive the biggest uptick in automated ad buying. Outlines the key factors driving advertisers and publishers to adopt programmatic technologies. Explains the players in the programmatic/RTB space. Looks at how pricing is trending for programmatic buys. Examines the barriers to widespread adoption of programmatic technologies. For full access receive to all BI Intelligence’s analysis, reporting, and downloadable charts on the digital media industry, sign up for a free trial.